It hasn't yet been a whole week since I last ran, but it feels like a month. I find myself giving runners whizzing past my kitchen window the evil eye at all times of the day. I had horrible thoughts about a woman running past recently - she was wearing a running skirt. Why on earth would you want to wear a skirt while running? What's wrong with shorts, or tights? Seems a bit extravagant and fashion-show-esque to me. Like the people that go to the gym wearing makeup and all the latest gear and barely break a sweat. Then I realised I was just being all bitter and twisted, envious that it wasn't me out there, pounding the pavement. People can wear what they want when they run. If a girl wants to look pretty and wear a skirt, then so be it. Personally, not my thing. But to each their own. I haven't been completely idle though, as I have managed to visit the Tepid Baths three times this week (no visit Wednesday or Thursday - other stuff to do. Plus I only have (had) one swimsuit. More on that later). This morning, I was very happy to achieve a fairly decent 1,000 metres. Or does it sound more impressive when you say 1km? Either way, considering my completely cabbage swimming technique, I thought that was pretty damned awesome. That's a total this week of 2.1km. I look forward to beating that next week. And I think my technique is improving. I'm also getting faster. Having said that, I still take a wee break between laps. Some a matter of a few seconds, some a little longer. I guess it's a bit like taking a walking break during your run (which I don't normally do, unless you count the occasional hill. But I'm better at running than swimming. More practice I suppose). I had my knee assessment on Wednesday, and it's official - I have patellofemoral syndrome, aka: Runner's Knee. No surprises there. Also not surprising, it is mostly caused by overuse. Whoops. On the plus side, there is no ligament damage, and with a bit of time and lots of muscle strengthening work, I should be able to get back into running soon. Ish. My left IT band is weak, which is causing my knee to turn inwards, and my quadricep muscle to tighten. I was not aware of this, so having the physio explaining exactly what is happening and how I can fix it is really good. Now I just need to keep doing my stretches and be patient. Ugh. At least I can swim. However, only owning one swimsuit is making it a little hard to swim every day, or nearly every day. So I decided to head out and buy some more. And I figured it was about time I stop being so prudish and get a bikini. Thousands, nay, millions of women wear them regardless of body shape or age, so why shouldn't I? Right? I just have this slight... body image issue... created when I was pregnant with X. I put on a massive 25kg - yes that's right, 25kg. Over twice the average weight gain for a normal pregnancy. That's more than what X weighs now, at age nine! Ridiculous. In any case, it created a lot of stretch marks. Sadly, putting on that amount of weight in the space of about six months is a surefire way of ending up with a tummy covered in wrinkly old-lady skin. My stomach is flat, just a little... textured. Deane says I should just get over it and stop worrying, nobody cares. So I'm trying to. I went out and bought a bunch of bikini tops and bottoms (they had this awesome deal on at the Cotton On Body outlet store in Dressmart Onehunga - $2 a piece! Bargain!) Now I just have to work up the courage to actually wear them. Let's be honest, they're not the most practical attire for swimming. They're probably not even really designed with swimming in mind. Rather, lazing about by the pool, or bouncing around on the sand looking fabulous. Well, I'm going to buck the trend and actually wear them for swimming. Eventually. Perhaps. 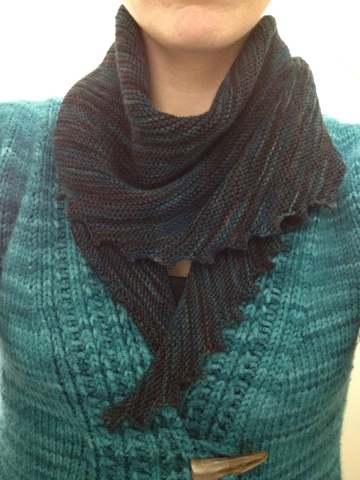 Still branching out a bit and knitting other stuff, but I'm getting there. Only seven things left to knit before 31st December. That's totally do-able, right? Work 20 rows total of the slipped st heel pattern, creating 10 slipped stitches each side of heel flap. For the heel turn, sl 1, k15, ssk, k1, turn. Sl1, p8, p2tog, turn. Cont. as standard. 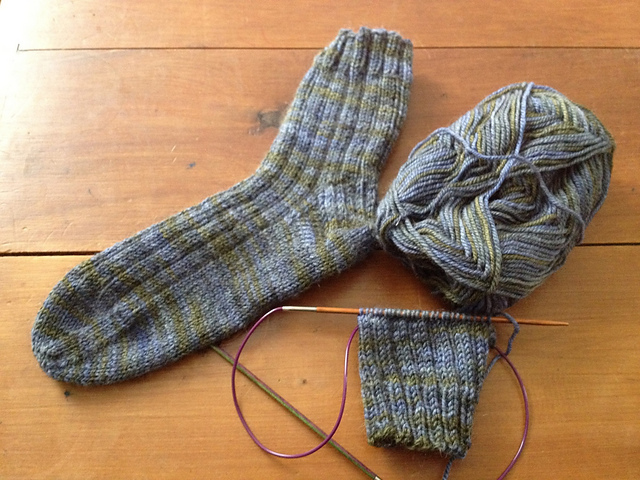 Pick up and knit 10 sts each side of heel flap. Dec every second row until 52 sts total. Work foot to 13.25cm (T's foot is 17cm long). Work standard toe, decreasing every second round until 16 sts total. Graft toe, and weave in ends. Done! Now I just have to make a slightly bigger pair for X. Might change the ribbing pattern so I can easily tell the pairs apart, since his will be knit in the same colour. Last night, because I didn't really feel like knitting another pair of socks (because seriously, four pairs in a month is enough to earn a break) I cast on the Step Ribbed Stole, with some scrummy Touch Yarns Hand-painted 8ply that was gifted to me a little while ago. There's no hurry for this, and no definite recipient in mind (although ideas are forming), so I only did about 15 rows before putting it down for the night. What I discovered when gathering the needles and yarn for this project is a) I need more 4.5mm needles, and b) I was knitting Deane's sweater with two different sized needle tips! One was 4.5mm - the correct size - and the other was something like a 3.75mm, which explains why I was getting weird ridges in the knit fabric. I thought it had something to do with my purling technique! What a dork! So I have decided to completely frog that half-hearted attempt, and put it aside for now (or rather, leave it where it was, languishing in the WIP pile). I'll make a concerted effort to have a fully completed sweater knit for Deane in time for next winter. 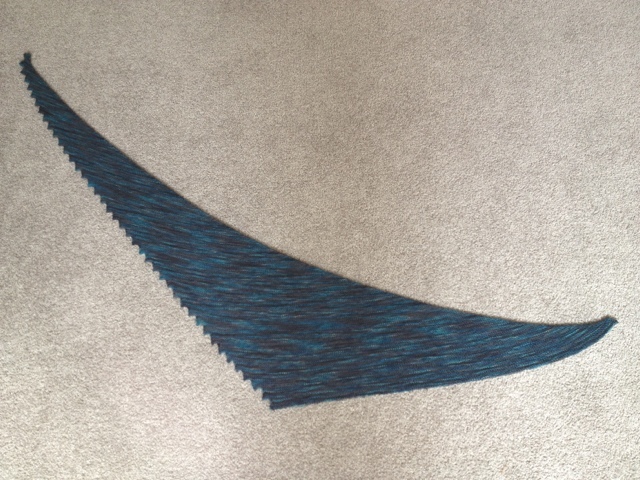 I haven't had any time to work on my Rock Island shawl since last weekend, so no progress there. Hopefully next week. I went to the Tepid Baths this morning for a swim instead, and managed my longest swim ever (I'm not much of a swimmer, let's be honest). 20 laps of the pool, which I believe is 25m. So, 500m. It took me about half an hour, and I had a wee 20-30 second break between each lap (alternating freestyle and backstroke - physio said breaststroke was a no-no, and I'm too uncoordinated to do butterfly), but I was pretty happy at the end of it. Unfortunately my knee still hurt, but at least swimming is a little less... harsh. I'm having an assessment done by the physio on Wednesday, so we'll see how that goes. 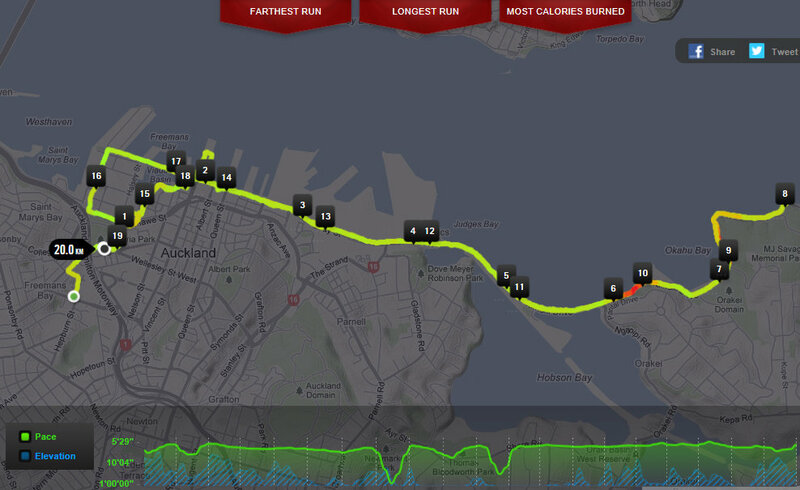 I hope to be back on track before the quarter marathon in six weeks time - if worse comes to worst, I can walk it, but I'd rather run it and try to beat last year's time of 1:05:08. Here's hoping! Ooh btw, just wanted to share some yummy stuff we had yesterday. When I arrived back home from my run it was 7am - the rest of the family is usually still in bed at that time on the weekend, but I was surprised to discover Deane and T hiding in the kitchen waiting to jump out at me. It is VERY unusual for Deane to be up at that time, especially on the weekend. I went and had a shower (it was raining, and I was soaked - running in the rain is a whole different experience! ), and Deane cooked breakfast. We had whole wheat waffles, bacon and grilled tomatoes (and Deane had grilled portobello mushrooms as well). It was so good! Probably more so because it was after a soggy run, and it was cooked by somebody other than me :-) As a bonus, there were leftover waffles which I had this morning with fresh raspberries and strawberries, and maple syrup. Yum!!! For dinner, we had this fish, again cooked by Deane. He used much less cayenne pepper, knowing the kids and I aren't fans of ridiculously spicy foods, and he had to wing it a bit with the 'honey mustard' - I believe he used honey and mustard ;-) - but OMG it was awesome! Even better, he made a salad with mixed baby lettuce leaves, red pepper, grated carrot, a handful of raisins, some sesame seeds and grated parmesan, with a dressing of macadamia and lemon myrtle oil, balsamic vinegar, lemon juice, and a bit of salt. Freakin' amazing!! I could totally eat that every day for a week! Sorry, no pics, it was so good I ate it too fast to even think of grabbing the camera. Tonight, I'm going to try my hand at making dahl (maybe with some spinach added), and some roti bread. I found the roti recipe in one of my latest foodie mags. The boys absolutely love roti, and it would be so cool if I could make it myself, rather than buying it at the supermarket. So I'm going to give it a go. On the plus side, it doesn't contain yeast. Wish me luck! Last week I bought a bag of onions, forgetting that I'd already bought a bag, so I'm thinking of making some onion marmalade. I adore onion marmalade, but I hate cutting up onions - my eyes are very sensitive. I blame it on the laser surgery ;-) Perhaps I can wear my swimming goggles (bought this morning before my swim) to avoid being assaulted by onion fumes... Oh, there is so much good food in the world! I love food. It is awesome. My current favourite is soy milk. Especially vanilla flavoured soy milk. Dangerously good! Have to try not to buy it, lest I drink the entire carton in one go. Ooh, now I'm daydreaming about roast lamb... Must be time for lunch, I'm rambling about food and getting hungry :-) Eat well and stay happy, people. Enjoy your week! I've rested my knee for nearly a week now. I plan to head out on some _very flat_ streets for a short 5km on Tuesday to test things out and see how they go. Even though I have no intentions of doing the half marathon any time soon, I'll be following this plan (scroll down to see the 'ten week schedule' I'm aiming for) - this would put the quarter marathon at about week seven, so I'll have to rejig that week a little (or possibly do two runs on race day, depending on how it goes. Oh God, I'm starting to sound crazy. Must get out for a run soon). Every non-running day I'll be doing my runner's-knee-specific stretches, which are designed to strengthen the muscles supporting the knees, in the hopes of improving their current state, and possibly preventing a recurrence. Fingers crossed! Shoes: current ones are fine (both pairs), as I have normal pronation. No need to rush out and buy specialist shoes/orthotics. Stretching: MUST START DOING THIS REGULARLY!!! To date I have not done any, either before or after a run. Or even in between. Note to self: you are getting older, and things don't work as well as they used to. Nor do they recover as quickly from a hammering. Look after yourself better! Running: Go for it, when it feels right. But for now, stick to flat surfaces - no hills or stairs, and start with short distances. DO NOT INCREASE YOUR DISTANCE MORE THAN 10% PER WEEK! And if all fails, go see the physio. He'll fix it for me ;-) Hmm, I wonder if the running plan is a good idea then? I'll ask next time I see him. Meanwhile though, it's been a busy/slow week. You know those weeks where you're seemingly on-the-go all the time, but hardly anything actually gets done? Yeah, I had one of those. With T sick half the week, I didn't start my assignment as planned. That'll have to be next week now. Saturday saw Deane and I sitting in the back of a friend's car on the way up north to look at a boat. For the friends. I have no interest in boats. But it gave me plenty of time to knit, so no complaints here. And it gave us a good five hours or so away from the boys, which can be nice every now and then. I love them dearly, but the noise levels can grate on the nerves somewhat. One Godric's Hollow hat in Malabrigo Rios 'Teal Feather'. And one and a half Dad Socks, knit in Waikiwi. 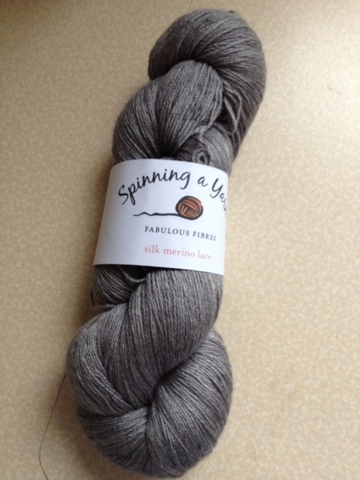 I bought the yarn from The Little Craft Store, which, sadly, is closing down (although I believe she'll be keeping her store online, but mostly fabrics). I only had two balls of the black, and didn't want to wait until next week to go buy more, so decided that some nice red contrast toes would look rather spiffing ;-) I should be able to finish the heel turn tonight, and the foot in the next day or two. Yes, I already knit a pair of these for Deane, but the pattern is so super simple I have it memorised, and the fit is so good and man-ish that I decided another pair was in order. Have a good week people, enjoy the Spring!! !